DeckLink Quad 2 features 8 independent SDI capture and playback channels in a single card. PCIe capture card with 4 HDMI inputs for capturing up to 4 different SD, HD, Ultra HD and 4K formats at the same time. Featuring 4 independent HDMI 2.0b input connections. DeckLink Quad HDMI is like getting 4 separate and customizable capture cards in one. Perfect for software live switching, real time computer game capture, streaming and more. The ultimate digital cinema capture card! DeckLink 8K Pro features four quad link 12G-SDI connections and works in all SD, HD, Ultra HD, 4K and 8K DCI frame sizes. You get support for 8 and 10-bit YUV 4:2:2, as well as 10 and 12-bit RGB 4:4:4 with full Rec. 2020 color. In addition, you can work at up to 60 frames per second in HD, 4K and 8K. The four 12G-SDI connections support 16 channels of embedded audio each, for a total of 64 channels. The ultimate digital cinema capture card featuring two full frame DCI 4K inputs and outputs via 12G-SDI! You get dual link multi rate 12G-SDI connections that work with SD, HD and Ultra HD even in Ultra HD 60p, as well as full frame DCI 4K at 4096 x 2160 resolution up to 25p! Capture 10-bit YUV or full color bandwidth 12-bit RGB. 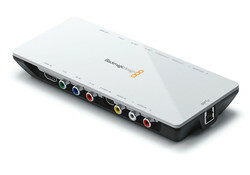 Includes AES/EBU audio, up, down and cross conversion, plus built in 3D stereoscopic output at full bandwidth 4:4:4:4 RGB! Low-cost, low-complexity monitoring: it's a 10-bit card that delivers the essentials with no fuss. For anyone who's shied away from monitoring on an external screen, there's now no excuse. 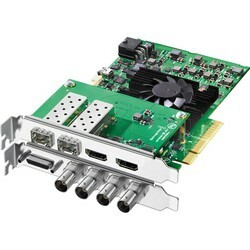 DeckLink Mini Monitor 4K is a low profile PCIe playback card, featuring 6G-SDI and the latest HDMI 2.0a connections so you can monitor all formats up to 2160p30 from your computer! The SDI and HDMI outputs let you connect to any television or monitor and automatically detect and switch between all video formats. You even get high dynamic range playback and metadata over HDMI. In today's all-digital world, this card may be all you need. There's little to configure, little to go wrong... it's the perfect solution for anyone that simply needs to ingest high quality video fast. DeckLink Mini Recorder 4K is a low profile PCIe capture card, featuring 6G-SDI and the latest HDMI 2.0a connections so you can record all formats up to 2160p30 on your computer! The SDI and HDMI inputs automatically detect and switch between all video formats. You even get high dynamic range recording and metadata over HDMI, along with support for Rec. 2020 color space. Handle every job from SD and HD work to Ultra HD and 4K feature film projects. Supporting colour resolutions up-to RGB 4:4:4 at full color bandwidth without any sub sampling, it's ideal for the highest quality capture, keying and monitoring. DeckLink Studio 4K is exceptionally well featured. It includes a massive number of analogue and digital video connections (SD to UltraHD 6G-SDI, HDMI 1.4b, SD/HD component, composite, S-video, 4 channel balanced analog audio, 2 channel AES/EBU switchable to 6 channel out, black burst and tri-sync reference input, RS-422 deck control connections, keying in SD and a hardware down converter. Its price and size make Blackmagic's UltraStudio Mini Monitor one of those products that it's difficult not to own. Whenever you need to show video on an HDMI monitor, this handy little Thunderbolt device is at hand. The concept is brilliant - edit on your MacBook Pro and monitor on a hotel TV; play video onto a projector from your Mac Book Air in high quality with true colours. The icing on the cake is that it doesn't need an external power supply. UltraStudio 4K is the perfect partner for tapeless workflows based around DaVinci Resolve, Avid Media Composer, Final Cut Pro or Premiere Pro. 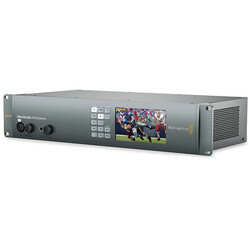 Sporting virtually every type of video and audio connection, the unit connects to a Thunderbolt equipped PC for reliable ingest and playout of full resolution media. Portable Thunderbolt 3 capture and playback solution with 3G-SDI, HDMI and analogue connections. It can capture and playback all formats up to 1080p60 in full 10-bit YUV, or up to 1080p30 and 2K DCI in 12-bit RGB.